Student loan debt passed a trillion dollars in the United States. Here's how to avoid it. Experts say 25 percent of graduates are drowning in debt by the time they receive their degree. Danny and Amber Masters admit to being part of that statistic. The couple ended up with almost 600k in student loan debt after graduation. Danny a dentist and Amber an attorney started a blog. The site, http://www.redtwogreen.com/?p=117 , details their get out of debt plan. For the couple it’s about living well below their means, working 2nd and 3rd side jobs and meeting weekly to go over their progress. The couple says they've knocked 30k off their debt in just the last 7 months. 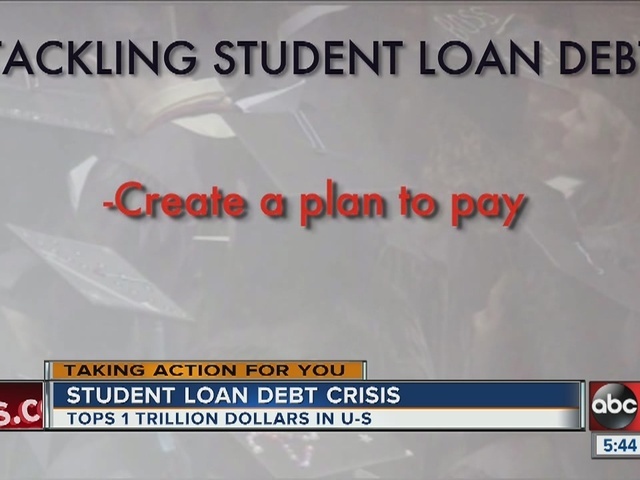 Between cutting expenses and working 2nd jobs they plan to pay off half a million dollars in student loans in the next 5 years. The best option is to avoid all this debt in the first place. To do that shop around for a good deal on a school, private isn't always best. Number two apply for every single grant and scholarship you can find there's a lot of money on the table for college students. Number 3 don't live off student loans alone get a part time job to offset expenses.